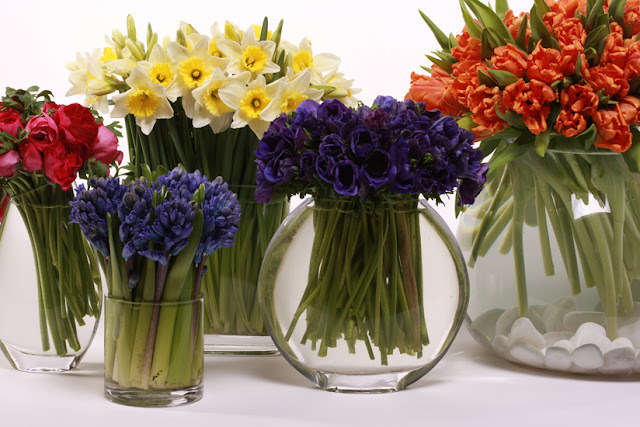 Celebrate Spring with bulb arrangements! Tulips: Make sure tulip petals aren't too open, and the foliage is nice and green. Tulip leaves are light green, but should not be yellow. 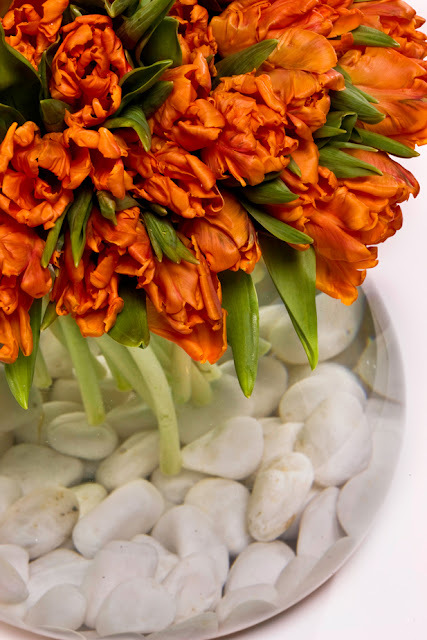 When making your arrangement strip away the unwanted floppy leaves before putting the tulips in water. Ranunculus: Ranuncula petals have ruffled edges, even when they're super fresh. Just make sure their petals don't look papery and that the center is closed with more petals to open. 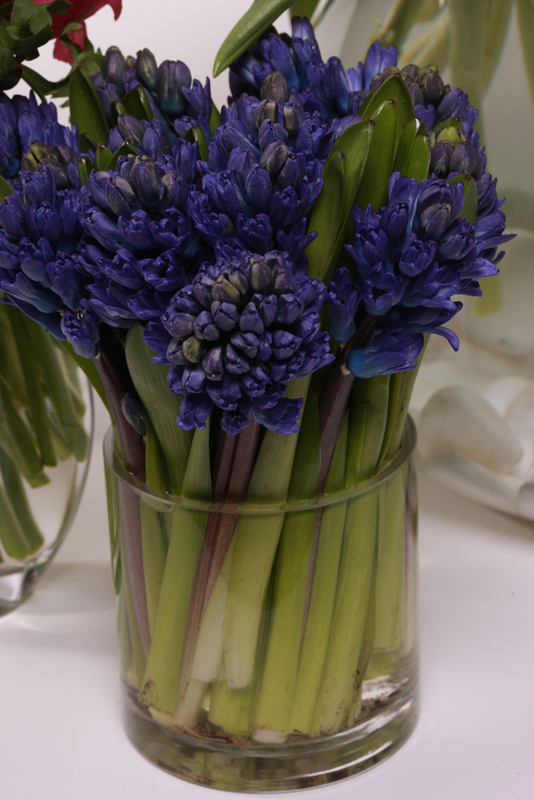 Most bulb flowers have beautiful, sleek green stems that look great in clear glass vases. 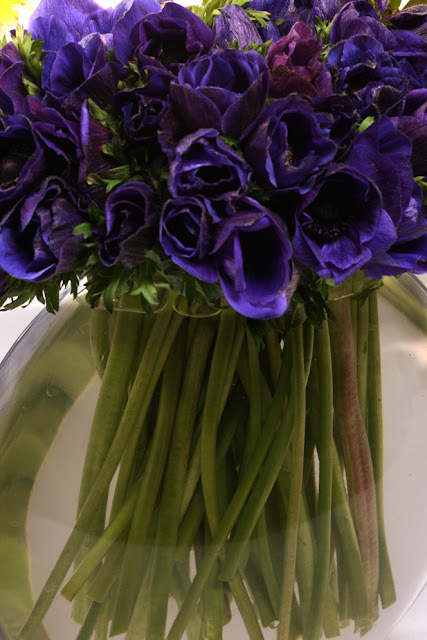 Showcasing the stems enhances the beauty of the overall arrangement. When arranging daffodils, hyacinth and narcissus, use vases with straight edges and subtle curves; this will make make it easier to arrange their soft straight stems. Bulb flowers are gorgeous when mixed with other variations. That being said, you'll NEVER go wrong with an arrangement composed of one kind of flower in a monochromatic color (as pictured). As always, cut your stems at an angle immediately before submerging them in water. For a decorative accent, submerge glass pebbles or river rocks at the bottom of the vase. Remember to add water to your arrangement daily. Some bulb stems, especially hyacinth, can soften quickly and turn the water murky (and stinky!). This can be avoided by flushing the water every couple of days. 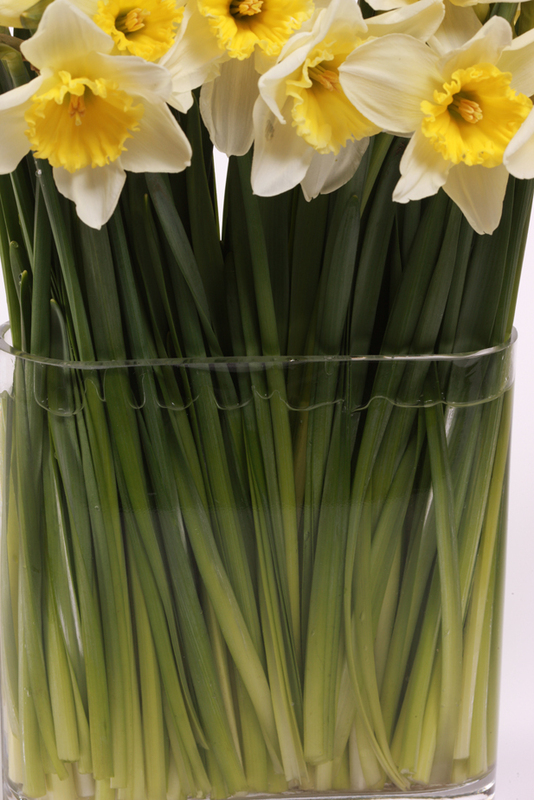 Narcissus and daffodils typically last three to four days. Anemones last five to seven days. Hyacinth lasts five to seven days. It was my daughter's 3rd Birthday in June - I was 37 weeks pregnant (which made everything a little harder) but none-the-less it was so much fun to plan and I was very happy with the turn out! <3 Way in advance I had the outfit custom made to match her ranch themed party. All pictures were taken by DameDap Photography - the candy was by far the hardest thing to put together- I shopped and researched online and found some amazing sites for candy and other vintage items. www.sugarmancandy.com and shopsweetlulu.com All the straw buckets and bandanas were ordered from Oriental Trading Company and Micheal's had amazing farm buckets to place the candy and fruit in. All cowboys hats and sheriff goodies were from Oriental Trading Company. Signs were made from boards and paint picks purchased at Home Depot. Lemonade Stand Items were purchased from wholesale restaurant companies - where I was able to buy mason jars, vintage caps, swirly straws, and lemonade jugs in Bulk. Email me if you are interested as there are too many to name in this blog. As a creative keep sake - I had told Damian our photographer to photograph all our guests so that we could send them along with the Thank You notes a picture from Ella's Birthday. We used mobil frames (purchased at Micheal's and were painted at my shop) - of course all the flower decoration were designed at our studio and made by Blooming Flowers staff! Balloons were purchased on different Farm Themed websites - again email me if you are interested. We also told everyone to bring their "Barn Yard Gear" to make the party that much more festive! They led the birthday girl in a mini parade around the ranch before we sang Happy Birthday to her - needless to say she threw a fit when we tried to remove her from "her" pony. The hardest part of Ella's outfit was finding her real cowboy boots - they were special ordered and were quite pricey considering she has never worn them again. This Ah-MAZING cake was made by very dear friends of mine who own a company called SUGAR BASH - he is by far the BEST cake designer I have come across and in my industry I have met many. They made all the dessert items for our dessert station and the cake which was breathtaking!